If you frequently access a specific location using File Explorer, you might want to add that location to the Quick Access section of the Windows 10 navigation pane for easy access. The Quick Access section is located at the top of the navigation pane. It lists folders in alphabetical order that you visit frequently. 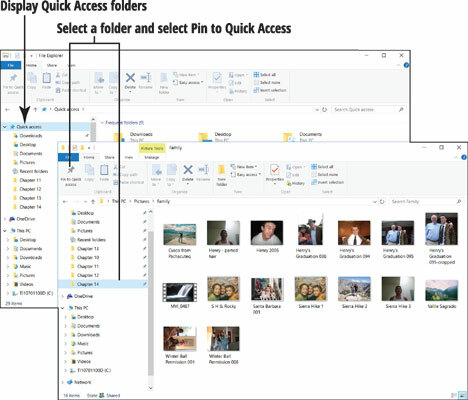 Windows 10 places some folders in the Quick Access folder list automatically, including the Documents folder and the Pictures folder. Display the Quick Access folders. To do so, click or tap the right-pointing arrow next to Quick Access in the navigation pane, as shown. Select a folder that you access frequently. For example, if you’re currently working on files you keep in a folder called My Work, select that folder in the navigation pane. On the Home tab, select the Pin to Quick Access button. The name of the folder you selected now appears in the Quick Access folder list. Notice the pin beside its name. Select your folder in the Quick Access folder list. Next time you want to get to this folder, you can get there quickly by selecting Quick Access in the navigation pane and then selecting your folder. To remove a folder from the Quick Access list, select the folder you want to remove. Then right-click the folder and choose Unpin from Quick Access on the shortcut list.